To scroll through the replies of the Dead Island Twitter account is to expose yourself to what Far Cry 3’s Vaas once identified as the definition of insanity. The feed contains reams and reams of vague assurances about the continued existence of a game that’s been in development for well over half a decade, and while you have to admire Deep Silver’s consistency, you can equally understand why people won’t stop asking about it. Since the sequel to Techland’s original open world zombie game was announced in June 2014, Dead Island 2 has shifted between at least three separate development studios, been subject to extensive creative refreshes, and has essentially been in hiding for several years. Aside from a few trailers and gameplay demos in 2014, and a couple of vague statements after that, we know very little about the state the game is in, or what it even looks like at this point in time. Desperate to find out more, I’ve tried to learn everything I can about what the hell has happened to Dead Island 2 since we last saw it. I’ve scoured the four corners of the internet, spoken to some of its many developers, and retraced the game’s troubled development history step by step in an effort to draw up a definitive timeline. Truth be told, I may now have more questions than I did before I started out on this fact finding adventure. Dead Island 2's publishers are so reluctant to talk about it that you can’t even confirm who’s working on it anymore. Part of the trouble with getting to the bottom of what exactly is going on with Dead Island 2 is that the game sits in a spaghetti bowl of ownership. Not only has it been worked on by four different developers (more on that in a second), but the Dead Island IP has several more companies attached to it on the business side. To put it as succinctly as possible, the property is owned by Deep Silver, which is the publishing division of Koch Media, which itself is the sister company of THQ Nordic, previously known as Nordic Games before it acquired several IPs from the bankrupt remains of THQ. Dead Island 2 was originally supposed to be developed by the studio behind its predecessor, 2011’s Dead Island, but Techland left the project in its very early stages to create a different kind of zombie game, Dying Light, with Warner Bros instead. As a result, Deep Silver brought on a new studio, Yager Development (Spec Ops: The Line), to reboot development and start afresh on the property. 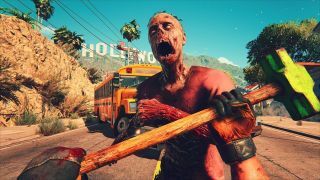 The fruits of their early efforts represent the last thing we properly saw of Dead Island 2, as it was revealed to the public at E3 2014 and tagged with a somewhat ambitious Q2 2015 release date (ha!). Unlike the original Dead Island, which takes place on the fictional tropical island of Banoi, this sequel would be set in several real life cities across California, with an expanded crafting system and co-op for up to eight players at a time. Yager even showed off some impressive gameplay at Gamescom in August 2014, but the partnership was not to be. In a statement in July 2015, Deep Silver announced its “decision to part ways with development partner Yager”, before promising to “continue working towards bringing our vision of Dead Island 2 to life and share further information at a later stage." At that same time, Sumo Digital’s COO Paul Porter said “we’re looking forward to exceeding fan expectation with an ambitious design that we’re confident will take bone-crunching, visceral, zombie action to a whole new level.” And, from here, the noise began to mysteriously fade. We’ve barely heard a whisper from either Sumo Digital, Koch Media, Deep Silver, or THQ Nordic about the game since that announcement, other than the fact that it still exists and that it is indeed in active development. But that silence is becoming deafening, especially amid whispers on the grapevine of what’s happened to Dead Island 2 in the years since. In December 2015, for instance, former Yager developer Jan David Hassel stated on Twitter that Dead Island 2 is “supposedly at DS Dambusters now”, the UK based subsidiary of Deep Silver that most notably gave us Homefront: The Revolution in 2016. While I can’t find anything that explicitly links Dambuster to Dead Island 2, you can find a job listing on its website for a Level Designer to work on an “established AAA franchise.” What’s more, a leak from last year suggested that Dambuster was currently working on three projects, one of which was a “multi-project collaboration with international publishing partner” to help bring an in-development FPS to console. Hmm… I reached out to Jan David Hassel, but he declined to comment. That said, there’s plenty of evidence to suggest Sumo Digital is still working on Dead Island 2, even if it’s now in collaboration with Dambuster. It’s mentioned on their website, on its employees’ Linkedin pages, in THQ Nordic’s financial reports, and elsewhere, so perhaps Dambuster hasn’t taken over development, but is merely assisting Sumo while the latter juggles several projects at once. I also reached out to several people at both Sumo, Dambuster, Koch Media, and THQ, but few were willing to make any comments on the record, and I couldn’t even get anyone to verify whether Sumo or Dambuster is actually taking lead on development. This is what’s so frustrating about Dead Island 2. Its publishers are so reluctant to talk that you can’t even confirm who’s working on it anymore. Perhaps Sumo is waiting until Crackdown 3 finally releases in February before reconcerting their efforts wholeheartedly on getting Dead Island 2 out of the door. Perhaps Dambuster was placed in charge of development after Crackdown 3 was delayed again by Microsoft into 2019. Perhaps all of Yager’s previous work was entirely ditched in 2016, and Sumo’s iteration is something completely different. Perhaps we’ll see a completely new iteration of the sequel at E3 2019 this year, and it’ll be out within the next 12 months. At this point, anything is possible. THQ Nordic still has the game listed for PS4 and Xbox One, after all, so the company presumably wants to release it before the launch of Xbox Project Scarlett and PS5 eats into their potential audience. In the meantime, you only have to ask Dead Island’s Twitter page for regurgitated reassurances about the game that refuses to die, but stops short of saying anything other than to confirm its own existence; “Dead Island 2 is still in development!”. Even without Dead Island 2, there's a ton of undead fun to be had with the best zombie games already begging you to play them right now.